SilverStone has announced its new high-wattage 80 Plus Titanium PSUs for high-performance desktop computers. The new Strider Titanium power supplies are rated for up to 1500 W output. The main selling point of the new power supplies is their depth, which has been shrunk to 180 mm, making them compatible with smaller chassis and builds. There is an ongoing trend towards miniaturization of all kinds of computers, whether they are mobile or stationary. Nowadays there are enthusiast-class Mini-ITX components (mainboards, PSUs, etc.) and therefore MSI’s recently launched X299M Gaming Pro Carbon AC high-end Micro-ATX motherboard supporting three graphics cards and 10 storage devices does not come as a surprise. Meanwhile, Micro-ATX cases sometimes cannot accommodate large high-wattage PSUs that are usually 220 mm long. As a result, as performance of Micro-ATX is growing, so is demand for smaller high-efficiency ~1 kW power supplies. 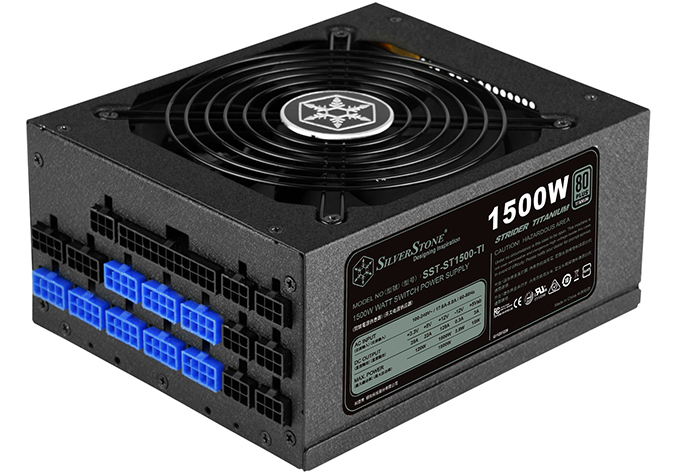 SilverStone is responding to this demand with its new ATX12V V2.4-compliant high-wattage Strider Titanium PSUs that comply with the 80 Plus Titanium requirements, are rated for 1100 W, 1300 W and 1500 W output and are 180-mm deep (or long, however you put it). To get the 80 Plus Titanium badge, a PSU is mandated to be at least 94% efficient under a 20%, 50% and 100% load as well as at least 90% efficient under a 10% load. The latter is particularly important for high-wattage PSUs because it helps to take advantage of energy efficiency of modern PC hardware even with a very powerful PSU. 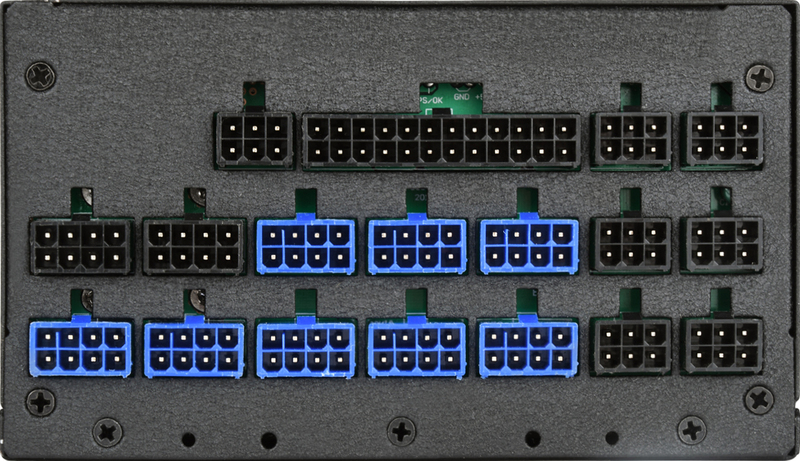 Like the many advanced PSUs these days, the SilverStone Strider Titanium 1 kW power supplies feature a modular design and come with two EPS12V connectors to enable compatibility with 2P server/workstations platforms, as well as with contemporary high-end desktop motherboards such as those based on AMD’s X399 'Threadripper' and Intel’s X299 'Skylake-X' platforms. As for other types of connectors, the new Strider Titanium PSUs have eight 6-2-pin (8-pin) PCIe auxiliary power connectors for graphics cards (just in case you run four AMD Radeon RX Vega 64 boards), 16 SATA power plugs, six Molex power outputs, and one FDD connector. All cables are flat to ensure greater flexibility. SilverStone claims that the new Strider Titanium 1 kW PSUs can work 24/7 with 50℃ operating temperature and will be absolutely quiet under light loads when their 135-mm fan is off. Meanwhile, even under high loads, the noise levels of the PSUs will not exceed 36 dBA. As for reliability ratings, the new Strider Titaniums are speced for 100,000 hours MTBF. To ensure safety, the power supplies are equipped with over current, over power, over/under voltage, over temperature, and short circuit protection mechanisms. The Strider Titanium SST-1100-TI, SST-1300-TI and SST-1500-TI are already listed by major retailers, including Newegg and others The most affordable model of the new Strider Titanium PSU has MSRP of $299.99/€269.90, whereas the highest-performing 1.5 kW model has suggested retail price of $399.99/€345.50. Meanwhile, the mid-range SST1300-TI is priced at €288.90 in Europe. All new PSUs are covered by a five-year warranty.